Michael Dunlop raises the Senior TT trophy on the rostrum with runner-up Peter Hickman (left) and Dean Harrison. Michael Dunlop clinched Senior TT glory with a powerhouse performance on the Bennetts Suzuki for his 15th Mountain Course success on Friday. 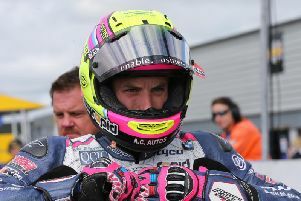 The blue riband race was restarted over the reduced distance of four laps after Tyco BMW’s Ian Hutchinson crashed on lap two at the 27th Milestone, sustaining a fractured leg. Senior TT winner Michael Dunlop at the top of Barregarrow in Friday's blue riban race. Hutchinson was later flown to Liverpool for further treatment last night as the Moneymore-based TAS Racing team’s 2017 TT ended on a low note. Ballymoney man Dunlop’s winning margin was 13.3 seconds over Smiths BMW rider Peter Hickman, with Dean Harrison from Bradford claiming third on the Silicone Engineering Kawasaki, a further 10.1 seconds adrift. “Today we made the impossible possible,” said an elated Dunlop. “It’s a brand new motorbike and it was hard work. I was under a bit of pressure there and I tried to go as easy on the bike as I could. Michael Dunlop celebrates with a burnout after clinching his 15th Isle of Man TT triumph in the showpiece Senior TT. “We could’ve had the double if we hadn’t had a problem in the first race but the bike did us proud. I can’t say enough about the team and the bike never missed a beat. It was Dunlop’s third win in the showpiece Senior race and his sixth overall in the Superbike class at the TT. He has now won 1000cc races for Honda, Kawasaki, BMW and Suzuki and has also delivered TT wins for Yamaha in the Supersport class. His team made key set-up changes to the GSX-RR before the Senior restart and Dunlop took the race by the scruff of the neck, lapping at 132.292mph from a standing start to open an advantage of 4.2 seconds over Hickman. The 28-year-old turned the screw on lap two with a blistering lap at 132.903mph as he slowed for his pit stop, extending his lead to 9.2 seconds. Dunlop lost a few seconds in the pits to Hickman and the difference between them as they began lap three had decreased to six seconds. However, he pulled away on the final two laps to put the outcome beyond doubt, claiming his second triumph of the week after his victory in the Supersport race. Team manager Steve Hicken said: “That's why we came here. We couldn't have any other aim than winning. As we've said all week, it's taken a lot of hard work to get here as the only team in the paddock with a brand new bike, and we've seen others struggle. “It was a shame about Saturday, when we were looking like we could have taken the Superbike win as well, but we learnt from it and made the right changes for today and this is the race everyone wants. And when you consider how early the bike is in its development, it's an even bigger achievement, and it shows there's more to come,” he added. “But we have to also say a big congratulations and thank you to Michael, as without him and his input, feedback, and speed around here, this wouldn't have been possible."